What went down at today's event in Cupertino and what came of it? Apple took to the stage today at its latest iPad event in Cupertino to announce several different models today, beginning with a cryptic "September 2014" screen, hearkening to the iPhone 6 sales numbers and announcing that the iPhone 6 and iPhone 6 Plus set new records for sales in the first 30 days of their release "by a whole lot," and the iPhone will launch in China in a few hours as of the time of the event. Tim Cook got things started by announcing that support for Apple Pay has grown to include 500 more banks than when it was initially announced, and confirmed that you can use it online. Apple Pay itself is slated to launch this Monday, October 20, so we'll be able to get our first look at it very, very soon. On the Apple Watch front, Cook went over the practical appeal and looks in the fashion world. Those who wish to create their own apps and software for the Apple Watch can make use of WatchKit, which is slated to roll out next month. The Apple Watch itself is still set for an early 2015 release, so there will be plenty of time for developers to prepare for the release with ideas and applications aplenty. After a brief discussion of iOS features, user adoption rates, and how imperative it is to ensure consumers are using devices with the most current operating systems they can (touting iOS over Android, of course). iOS 8 continues to, of course, be an extremely important feature and aspect for Apple to tout, especially Metal and Swift for developers. On the iOS 8.1 front, the Camera Roll is making a return, as well as a public beta for iCloud photo libraries -- all in response to consumer feedback, Apple claims. The public beta will fofer the first 5 GB to users free, then $0.99 for 20 GB per month and $3.99 for 200 GB per month and tiers going all the way up to 1 TB. Additionally, Messages, iTunes, and iWork are all being updated with the rollout of Yosemite. All of your apps are being conditioned to work together, to sync together, and make sense from device to device. For instance, you'll be able to use AirPlay in the future with Apple TV without having to connect via Wi-Fi. The keyword is "continuity" in this event, and Apple demonstrated it in droves. You'll be able to make calls, texts, and use your phone's hotspot from your computer, as demonstrated during the event. And you don't have to wait any longer to experience Yosemite, as it's available today, October 16, for free. iOS 8.1 is following suit as well, which will be available Monday. Getting to the meat of the presentation, the iPad Air 2 was officially revealed, at 6.1 mm thick. The model Tim Cook showed off during the event was gold, revealing exactly what we had all suspected, 18% thinner than the original iPad Air. It features a laminated screen with the glass, LCD, and touch screen optically bonded for no air gaps. The anti-reflective coating is a nice touch as well, which is slated to reduce reflections by 56%. 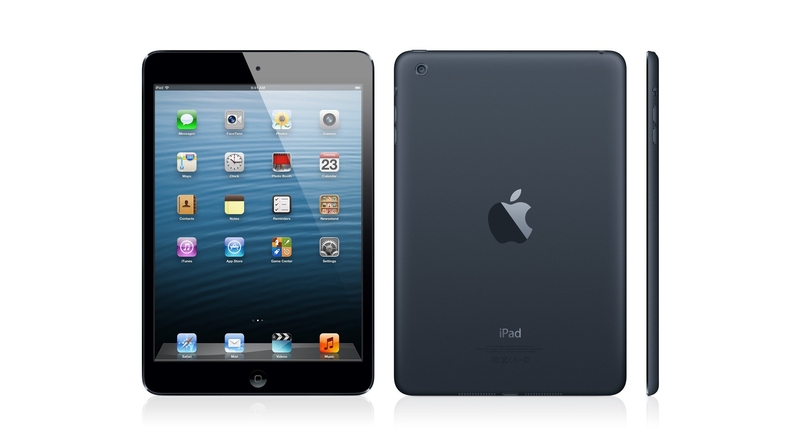 As far as the innards of the new iPad Air, it will feature an A8X processor, or a new version of the iPhone 6's chip. It's 64-bit, with a CPU that's 40% faster, 10-hour battery life, and 180x the graphical performance of the original iPad. Additionally, the new iSight camera is 8 MP, with 1.12 micron pixels, f2.4, with 1080p HD video. Not too shabby! A large portion of the showcase was dedicated to using the iPad Air 2 as a camera, in fact, which allows 43 MP panoramas and slow-motion video. On the other end of the spectrum, it looks as though that while Apple Pay is coming for the iPad Air 2, you're not going to be able t ouse it at retail stores, which is a bizarre move, even though it is a large device. 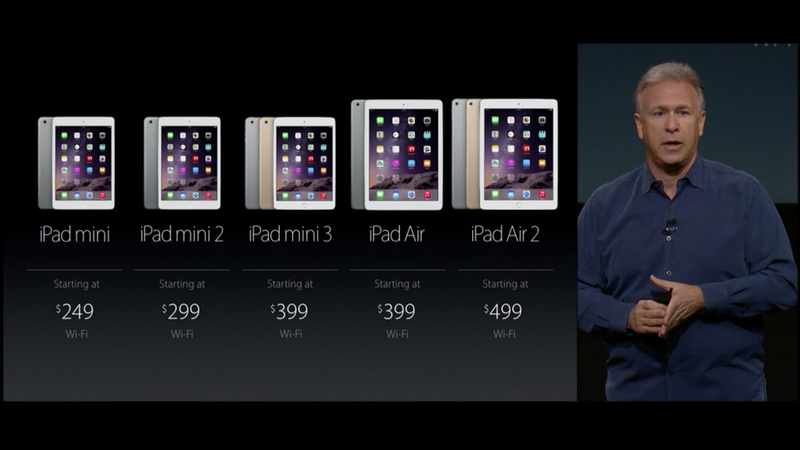 iPad Air 2 pricing starts at $499, with $599 and $699 models with Wi-Fi and 16 GB, 64 GB, and 128 GB, respectively. If you want to use them as cellular devices, you'll have to pay $130 more for the retail price of each model. Alternatively, the iPad Mini 3 will come in three different colors: Silver, Space Gray, and Gold, with a 7.9-inch Retina display, 5 MP iSight camera, 1080p HD recording, and Touch ID. They'll run you $529, $629, and $729 with cellular. It didn't get an extended explanation like the iPad Air 2 did, but it's important to note that the iPad Mini 2 and original iPad Air are going to say in production, but will drop in price. You'll be able to preorder both devices beginning tomorrow, October 17. The presentation moved right on to announce the iMac with Retina display, with a 27-inch monitor displaying 5210 x 2880 pixels -- a whopping 14.7 mililon pixels and "the world's highest-resolution display," known as the Retina 5K display. There's a chip inside to help control the display known as a "timing controller" and still manages to use 30% less energy despite the breadth of the display. Apart from the display, the new iMac specs include a 3.5GHz Intel i5 processor that you can upgrade to 4GHz i7, Radeon R9 graphics, and 1 TB standard hard drive. It'll start at $2499, with 8 GB of RAM, and begins shipping today. All of the prior iMacs will remain available as well. The presentation wrapped up with the announcement of the Mac mini, which will ship today. Conspicuously missing was the announcement of a television and some other miscellaneous things, but overall a strong presentation! What were your favorite parts? Which device are you most interested in?